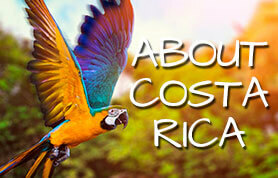 Costa Rica Honeymoon – A honeymoon in Costa Rica provides the romantic getaway of a lifetime! 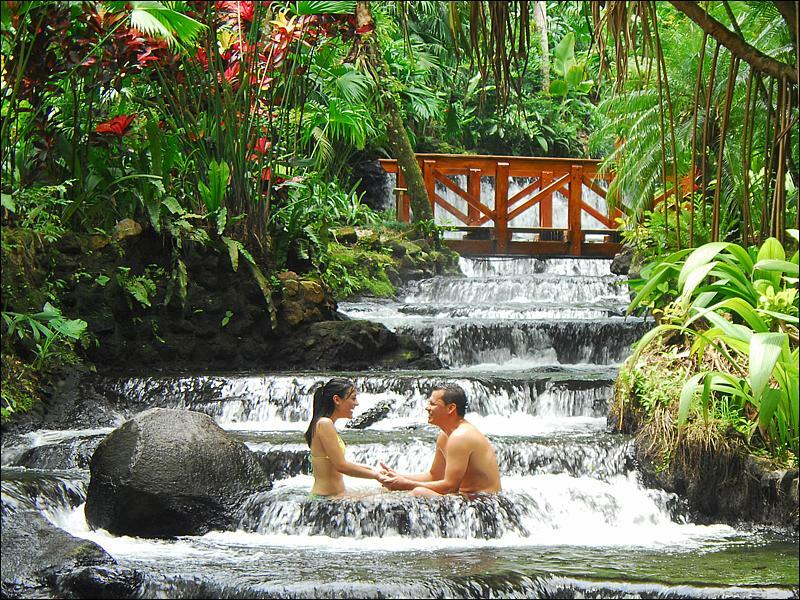 With its exotic natural environment & captivating romantic culture Costa Rica is the ultimate honeymoon destination on the planet earth. 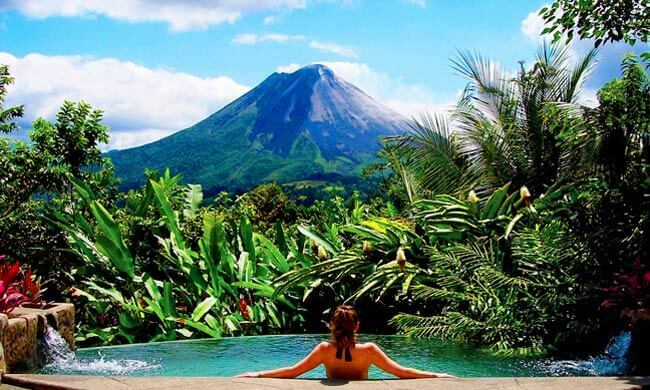 And our honeymoon tour packages in Costa Rica are the best way to make sure you both have the time of your life. We are here to make your planning as easy as possible. 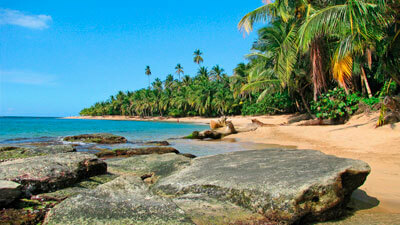 Our honeymoon tour packages Costa Rica offer endless possibilities for romance in a land of passion & exotic landscapes. Our driver will wait for you outside the terminal and leave towards Poás Volcano with its impressive main crater and its sulfur fumaroles and learn about the different ecosystems in this beautiful national park. Then a visit in La Paz waterfall gardens! Walk through a trail leading to a spectacular waterfall in the middle of the rainforest. Inside the park visit the hummingbird gallery, the serpentarium, the bird house, the butterfly garden and the frog’s exhibit. Later visit Doka Estate where you will learn about ancient techniques used by experts to produce one of the best coffee of Costa Rica and careful process that envelops the cultivation, harvesting and roasting of golden bean. (Breakfast, lunch, dinner) Early in the morning the 3 days / 2 nights tour to Tortuguero, breakfast will take place in a local restaurant along the way. Once you reach the small port of Matina / Caño Blanco, the tour continues by boat first on the river and then through the canals that run parallel to the coast until Tortuguero National Park, providing an excellent chance to take a close look at the wildlife. Enjoy a delicious lunch at the lodge in Tortuguero. In the afternoon, visit the Tortuguero village, which lies in the northeastern corner of the park, on a thin strip of land between the sea and the main canal where the laid-back style, the reggae roots music and the local people combines in this colorful village. At night dinner will be served in the main restaurant of the lodge and there will be free time to enjoy the facilities. Late at night a special turtle sightseeing tour (relevant only on August). NOTE: boat transportation on shared basis. Estimated driving time 6 hours (including breakfast stop and boat ride) Maximum load per person is 13kg but our clients do not have a weight limit. (Breakfast) Early in the morning a boat tour through the Tortuguero canals to enjoy the wildlife, the animals and the fauna in the swamp forest. After breakfast you’ll leave the Caribbean towards Guápiles. 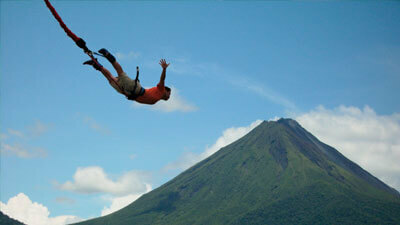 Once there meet your private driver and go head to Arenal close to the Nicaraguan border. This region possesses beautiful and varied scenery. 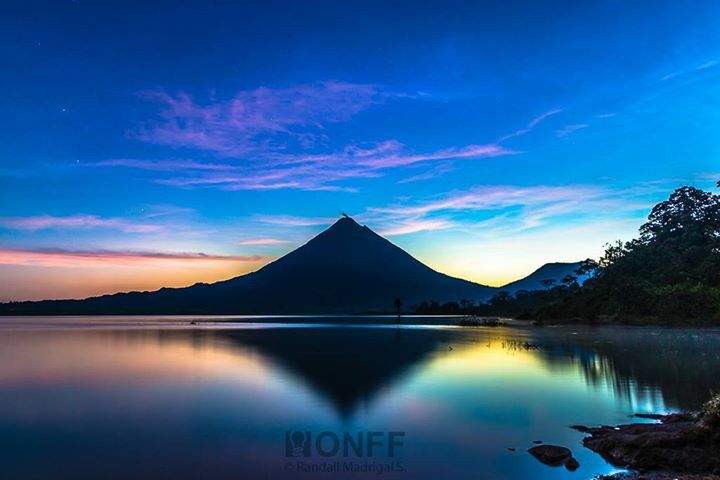 The lowlands host gushing rivers, hot springs, lagoons and plentiful wildlife. (Breakfast, lunch) The tour starts in a 3 km hiking trip through the tropical humid forest. Pass 15 bridges from 5 to 100 meters long and up to 60 meters high: spectacular scenery of birds, reptiles, mammals and insects. Next stop is La Fortuna waterfall with the huge swimming hole and the large rocks nearby. After swimming – lunch in town and tour to the volcano: hiking through the forest, plants, wildlife and Arenal Lake. (Breakfast) Today you are departing towards Santa Elena & Monteverde area (which means “Green Mountain”). 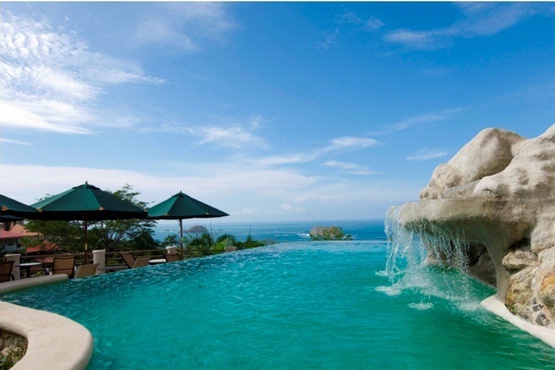 Breathtaking view of the Gulf of Nicoya and the islands below will accompany you while ascending the hills. The Monteverde reserve was founded in 1951 by a group of North American (Quakers) who live in a secluded on 1400 meter high plateau. Although some of the original virgin forest was cleared for dairy and coffee farming, the founders’ environmental consciousness, together with help from private organizations, founded a biological reserve that hosts one of the richest ecological systems in the country. Early evening enjoy the night tour – walking through the cloud forest trails surrounded by thick jungle where you can observe sleeping birds, tarantulas, spiders, grasshoppers, crickets, lizards, frogs, sloths, porcupines, white nose coatis, olingos, kinkajous, snakes and more. (Breakfast) Start the day by walking on the hanging bridges of Monteverde – five bridges in total, the longest is around 984 feet. The trails extend for slightly over a mile and a half (2.5 km), making this tour extremely feasible for everyone. 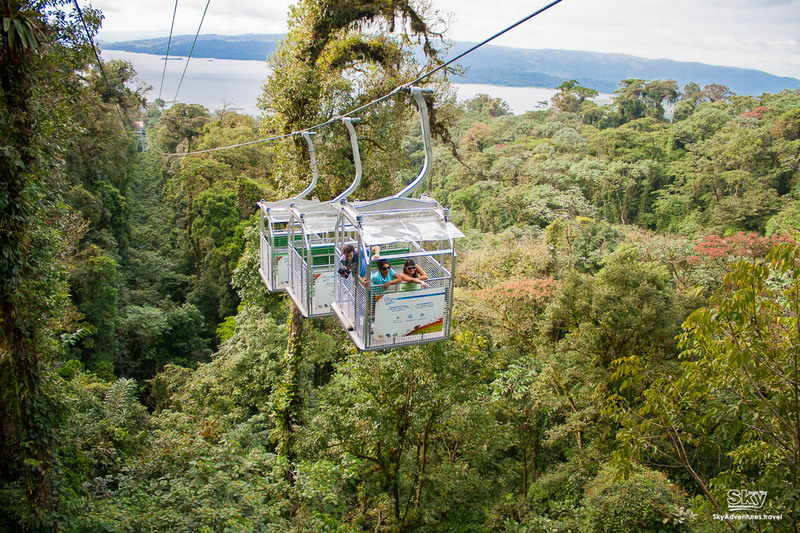 Following the Sky tram – it is a bird’s eye perspective on the cloud forest, Arenal Volcano and the lake. You can stop at any point in the breathtaking landscapes. The cable ends platform located at the highest point on the ridge, and forms the watershed between Pacific and Atlantic and provides a spectacular view of 360 degrees. Continue by flying, get your heart pounding 1.7 miles of cables slung between towering trees, zip lining through ten zip line cables range in height from 40 meters to 100 meters and in length from 100 meters to 750 meters. Then enjoy a tour to the coffee farm where you will have the opportunity to pick coffee beans and transport them to the grinding machine. Then visit the sugarcane mill where you will be shown the process of making brown sugar and other types of products which are made from the sugarcane. Enjoy a presentation of the extraction of guaro, a Costa Rican alcohol which is also made of sugarcane. At the end of this eventful tour you will be served “picadillo de arracache”, a traditional vegetable dish and a cup of coffee or lemonade. 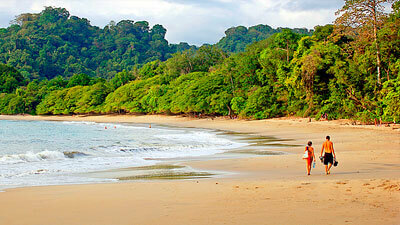 Today departs to the central pacific coast where Manuel Antonio is located. It is one of the most luxuriant locations in Costa Rica, with spectacular white-grey sandy beaches fringed by thickly forested green hills. (Breakfast, lunch) The Catamaran island adventure begins at Quepos Harbor; cruising through the aquamarine waters toward the spectacular and scenic coastline of Manuel Antonio Park. Soon you will be in open water and on the lookout for spotted dolphins, migrating humpback whales, sea turtles and manta rays. You will be captivated by the sight of dolphins frolicking at the boat’s wake, or the inimitable sound of a whale’s song. These are the nesting grounds and home for numerous species of marine birds, including pelicans, boobies and ibises. After touring the coastline, you will anchor in a protected cove within the pristine Biesanz Bay for snorkeling. Lunch on board. (Breakfast) Today immerse yourself in indescribable beauty, where nature reveals its flawlessness. In the mangrove tour everything flows harmoniously, the blend of fresh water and salt water, the diversity of the most extraordinary Costa Rica plants and wildlife in all its splendor. In perfect combination with the Manuel Antonio National park, the Mangrove offers 4 beautiful varieties of these amazing trees, unforgettable Costa Rican scenic and the magic that you can only feel when sharing one to one with the Costa Rican wildlife. (Breakfast) Today you have a free day to enjoy the beauties of the area or just relax at the hotel. (Breakfast) According to your int’l flight, depart to the Int’l airport. NOTE: please notice that check in for international flights recommended to be done two hours prior departure. Estimated driving time 3.5 hours.